Sonning | Where Angells Tread! We were last here 30 years ago and, even then, the place was a well known for gridlock, with traffic queuing both sides to cross the narrow bridge at Sonning Eye. We’re parking up at 8am on Bank Holiday Monday and already there’s a short queue for the bridge. How do local celebs cope living around here? Perhaps the Clooney’s arrive and leave by boat. This is a gentle, morning walk. Nothing too strenuous, just a pleasant climb onto the high ground above Sonning at Dunsden Green, followed by a loop past Binfield Heath and back to The Thames at Shiplake. 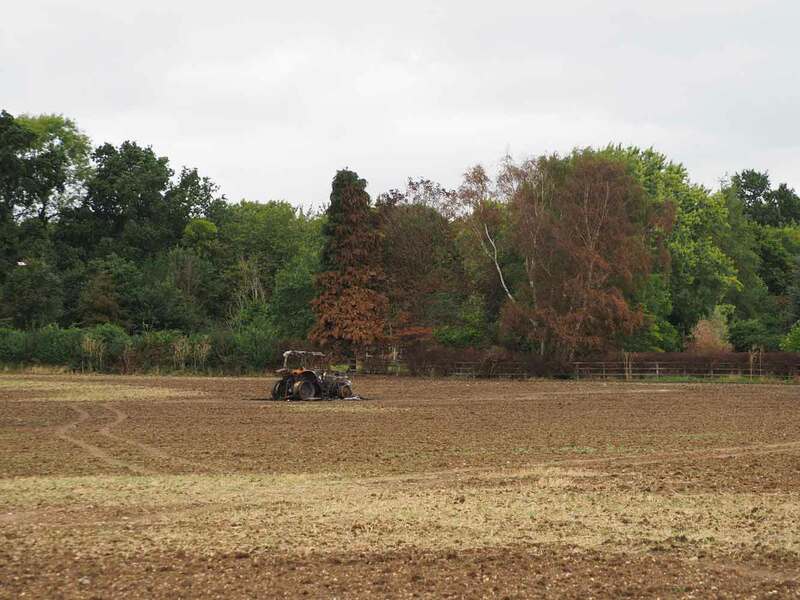 For a while we’re confused by the burnout remains of a tractor in the middle of a field near Shiplake…surely not local joy-riders? An inspection of the internet when we’re home explains all…it’s the consequence of the long, hot summer! The return leg, along the River, is uneventful. Occasionally, through the bankside bushes, we catch glimpses of a boat or a bevvy of swans (yes, that’s the collective noun…apparently) slowly drifting passed on the River. Otherwise, we have the path to ourselves. As we approach Sonning things change…the sound of queuing traffic hangs in the still morning air and by now the queues stretch through the village and back towards the A4. We smugly congratulate ourselves on our early start and we’re back home for lunch. A good 7.3 mile, cobweb-clearing, morning walk.